Alaha the Father sent Yeshua as the true bread from the heavens, and the purpose of this sending is to provide life to the world. Whereas the manna that fell in the wilderness for forty years gave life to one group out of all the world, the LAKHMA MEN SH'MAYA "the bread from the heavens," is able to provide spiritual life for people from all tribes and nations in the world! His linking Himself to the manna is for good reason! Just as the manna was a supernatural occurrence that did something that was otherwise impossible for the people to do, so too, the Messiah's coming did something that is impossible for people to do in and of ourselves. Once we see that He equates Himself to the manna, and the reason for it, when we return to the actual account from the Torah that records its coming, we will be able to appreciate the nuances of the text far better than if we left it with this declaration. With the Messiah's perspective in place, the manna account is transformed into an amazing portrait of Messiah. Let us proceed . . .
Notice that the manna fell upon the dew! It did not simply fall upon the ground to be gathered by the people like rooting animals, but fell firstly upon a layer of water, preserving it for pure harvest! This is important for us to consider, because it links to the coming of the Messiah, who, although was man in the flesh, was yet kept pure from all stain of sin. When we touch Him, we do not touch One who is muddied with the dirt of transgression, but One who came to us purposely in purity and remained in purity, for our sustenance. The above discussion is merely the first half of how the manna came to man. Exodus chapter 16, verse 14, gives us the second half of the method of delivery of the manna. It appears to be almost the same as the first, but contains a notable difference. Read well what the Word says here about how it came to the people. Here, the text gives a slightly different detail than the one from Numbers 11:9. This particular passage tells us that manna was seen when the dew ascended. What does this mean? The answer is that the Word preserves in both verses key elements that aide in understanding the delivery of the manna in a total concept. Both verses must be taken together to form the whole picture. Knowing both halves of how the manna was given to man helps us to see a bigger picture behind the symbolism of it all, and how it all relates to the Messiah, and the reasons for His own equating Himself with the heavenly provision. The fact that the manna had water underneath and water above it is essential for understanding how its delivery is so very special - more so than just that of a physical sustenance, but reaches all the way to a symbol for the Messiah. When we understand the factor of the manna having dew beneath it and dew above it, then we can begin to see exactly what the Holy One is trying to tell us. Almost all of the creation event was taking place between the waters above and the waters below. This factor parallels precisely the method by which the manna was given to the people in the wilderness! The waters above and below the main creation event are as the dew above and below the manna that fell. This shows us that the manna is a new creation, just as the creation event recorded in Genesis chapter 1 is a new creation. The manna had not been given to mankind before. It was a new food. It was a brand-new provision given to the people, untouched by the stain of Adam's fall. All animals and plants fell with Adam's rebellion in the Garden. Therefore, all foodstuffs became flawed and tainted with the consequences of his treason against the Creator. However, the manna was not part of the creation that had been handed to Adam to tend. It was new. It was unblemished. It was a new creation. And because it was a new creation, it came in the same manner as the new creation came, in order for us to see the love and care of the Holy One for His people! 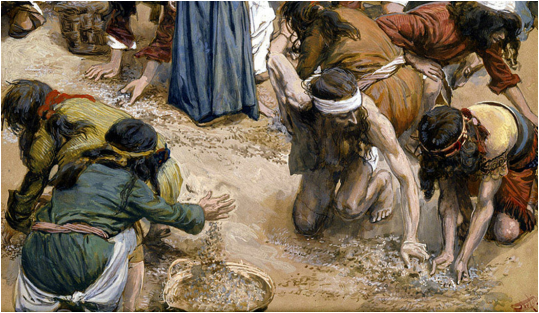 Just as the manna was a new creation provided especially by the Holy One, so too is Yeshua the Messiah the New Creation, the Second Adam, who came straight from the Holy One without the blemishes of Adam's sin, and provides for us a living spiritual sustenance in the wilderness of our rebellious hearts. He is the missing piece in the incomplete puzzle of the world. He completes the inadequacy of Adam by restoring what was lost and adding so much more. The nature of the coming of the manna is therefore extremely significant and worthy of carefully addressing. Knowing why it came the way it did allows the citizen of His Kingdom to appreciate all the more why Messiah equated Himself with such a unique provision. This verse holds two details of importance to us. This physical description of the manna helps us to see further connections to the Messiah. It looked like a coriander seed, and was the color of bdellium gum, which is a tree resin that has numerous uses from ancient times. The Hebrew term for "coriander" is therefore essentially bringing out the physical appearance of the seed, which looks like it has whelps all over it, or like it has been attacked. A quick look at the image provided above easily shows how such a name came to be given the seed in the Hebrew tongue. It makes complete sense. The coriander seed looks like it has been beaten. Applying this thought to the manna, we see that it was the color of a bruise and the shape of a coriander seed - a whelped and bruised-looking round object! This physical appearance factor of the manna directly applies to the Messiah. We know He was beaten and struck when He was on His way to the cross. Just as the manna was consumed when crushed into powder, so too would Messiah be struck and wounded before His true worth would be realized and benefit made of all He has to offer. Here is where the term is first used to refer to the food that fell from the heavens. In this verse, the question they pose, "What is it?" is the Hebrew phrase from whence ultimately comes the modern form we understand as "manna." The Hebrew is MAN HU, and literally means "What [is] it?" However, there is a deeper way which the believer can look at this question that seals it finally to the Messiah in the very essence of the word itself, and that is by the literal meaning of the term HU. While it can most definitely be translated as "it," the term HU actually has another meaning, and that is "he." It is the masculine gender form for "it," and is also the term used whenever Scripture wants to say "he." Thus, when the people were saying, "MAN HU?" while they obviously meant, "What [is] it?" they were at the same time technically saying "What [is] he?" or even "Who [is] he?" This detail is not to be missed to us who are looking back at the manna with the value placed upon it by the Messiah, who equated Himself with it, yet as the truest fulfillment of what it only symbolized. That they looked at the dew-encased food and said technically "What [is] he?" is an astonishing factor in all of this! Messiah definitely knew what He was doing by relating Himself to this special sustenance! This passage brings it all together. The one time the phrase is used in the Aramaic New Covenant writings is found here, where Messiah is being beaten, bruised, whelped, and is soon going to be used up for the provision of all who come to Him. It is here, when the soldier says, "MANU HA" "Who is he..." that the phrase is found. It was so long before, in the wilderness, that the people looked upon the strange presentation of heavenly bread before them, and asked, "MAN HU? / "Who/what [is] he?" Then finally, after so many long generations, and in a new wilderness of sin, when the true bread from heaven came - the Son Himself - at His strange presentation before His people, the same question was asked, but in such a way that the those immediately present had no idea that they were linking the two events through time, nor the significance of this "Man" who stood before them, who could make them, as He was, a new creation, if only they would come to Him for sustenance. The question His people asked so long ago: "MAN HU?" / "Who [is] he?" is still a question that must be asked and answered by each of us today. Who is He? He is the Manna from heaven, given for us!